The ‘Doors to Hell’ — a col­lapsed Soviet oil rig — has been burn­ing for over 40 years, far longer than the anti­cip­ated few weeks. Bordered by Kaza­kh­stan, Uzbek­istan, Afgh­anistan, Iran, and the Caspi­an sea, present-day Turk­menistan has been at a cross­roads of world civil­iz­a­tions for a mil­len­ni­um. 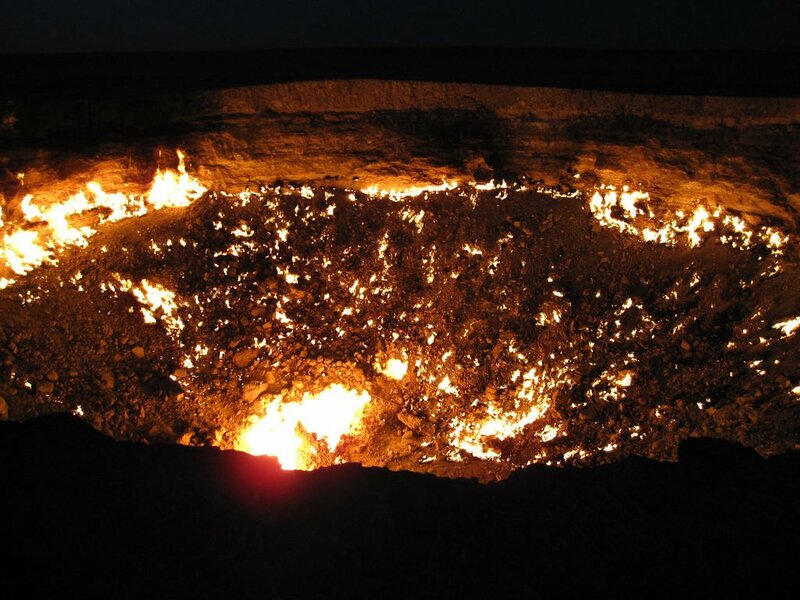 The city of Merv was one of the great Islam­ic cit­ies, and until the fif­teenth cen­tury was an import­ant stop on the Silk Road, a trad­ing route that con­nec­ted Europe, Asia, and Africa. This region of cul­tur­al milieu was fur­ther emphas­ised by a his­tory of dif­fer­ent rulers, includ­ing Alex­an­der the Great’s Per­sians, Islam­ic rulers, Turks, Mon­gols, and finally Rus­si­ans in the eight­eenth cen­tury. Des­pite fig­ur­ing prom­in­ently among regions opposed to Bolshev­ism, Turk­menistan became a Soviet repub­lic in 1924 and only gained inde­pend­ence at the break-up of the USSR in 1991. A recent his­tory of Rus­si­an rule has meant that like oth­er cent­ral Asi­an states, Rus­si­an lan­guage has remained the Lin­gua Franca post-inde­pend­ence. Although there have been attempts to homo­gen­ise Turk­men iden­tity since the 1930s, cul­ture still has dis­tinct unique clan-based char­ac­ter­ist­ics, each with their own dia­lect and style of dress. 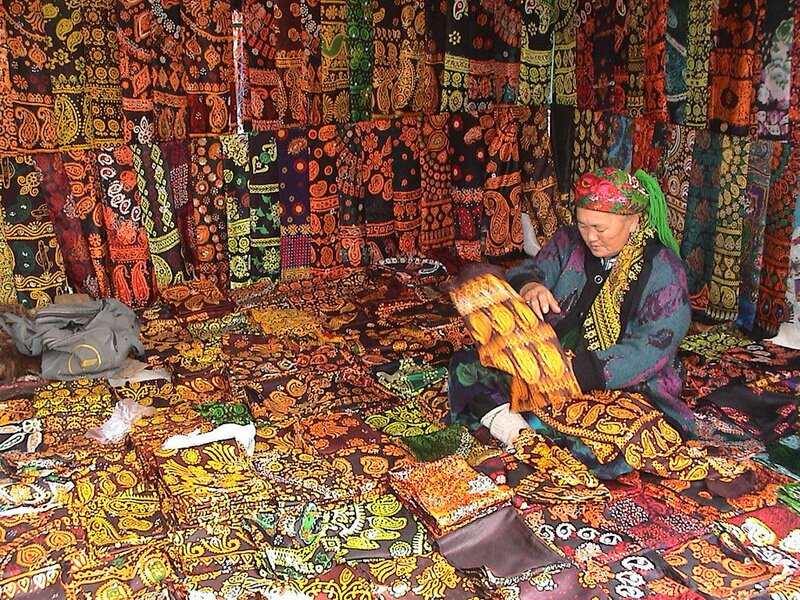 As a nation, Turkmenistan’s most famed cul­tur­al export is its Turk­men rugs (often known as Bukhara rugs in the rest of the world). Through­out Turk­men mater­i­al cul­ture, clan dif­fer­ences can be observed in the styles and col­ours employed, most obvi­ously in cloth­ing, jew­elry, and domest­ic dec­or­a­tions. Anoth­er dis­tinct­ive mani­fest­a­tion of Turk­men cul­ture are the large black sheep­skin ‘Telpek’ hats often worn by men, some­what resem­bling an afro hair­style. Although the nation­al cuisine of Turk­menistan pos­sesses strong con­tinu­ity with the rest of Cent­ral Asia, one unique ele­ment is the elev­ated pos­i­tion of mel­ons; once the major sup­pli­er to the Soviet Uni­on, mel­ons are a sub­ject of nation­al pride, and are com­mem­or­ated dur­ing the Mel­on Day hol­i­day. A woman dis­plays a series of intric­ate car­pets at a mar­ket in Balkanabatt. Car­pet weav­ing forms such an import­ant part of Turk­men cul­ture, that car­pet design is even fea­tured on the nation­al flag. Des­pite elec­tions tak­ing place in 2012 and 2017, it is widely agreed that Turk­menistan is an auto­crat­ic single party pres­id­en­tial repub­lic, demon­strated by cur­rent pres­id­ent Berdimuhamedow’s abil­ity to win over 97% of the vote. A con­sti­tu­tion­al amend­ment in 2016 allows life­time pres­id­ency. Human Rights Watch have des­ig­nated Turk­menistan as ‘among the world’s most repress­ive and closed coun­tries’, where the ‘pres­id­ent and his asso­ci­ates have total con­trol over all aspects of pub­lic life’. This includes access to inform­a­tion, where the state con­trols all print and elec­tron­ic media, and where journ­al­ists who attempt to pub­lish mater­i­al con­trary to gov­ern­ment sen­ti­ment are at risk of impris­on­ment and/or viol­ence. Polit­ic­al dis­sid­ents are com­monly incar­cer­ated or forced into exile, and even in exile, there is risk of gov­ern­ment repris­als for con­tin­ued open gov­ern­ment dis­sent. A supreme legis­lat­ive body known as the Halk Mas­la­haty, com­prised of up to 2,500 del­eg­ates (some of whom are elec­ted by pop­u­lar vote) is entirely made up of mem­bers of the Demo­crat­ic Party of Turk­menistan, and is chaired by the pres­id­ent for a life term. 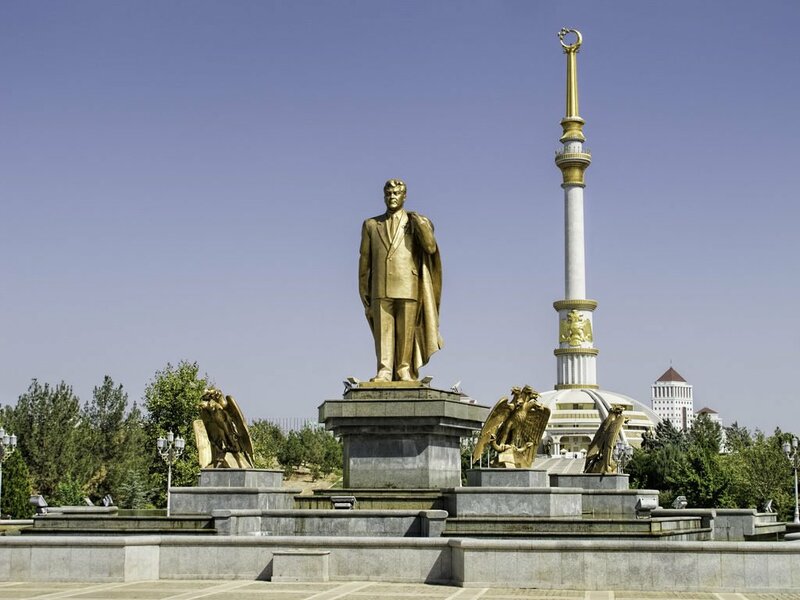 A giant golden statue to Turkmenistan’s first pres­id­ent — Sap­ar­mur­at Niyazov — stands over­look­ing Ashgabat. Extens­ive nat­ur­al gas reserves, the fourth largest in the world, mean that since 1993 cit­izens have received elec­tri­city and nat­ur­al gas free of charge by the gov­ern­ment. These vast reserves also dic­tate the country’s inter­na­tion­al rela­tions. A pipeline con­nect­ing China and Turk­menistan has ensured China is the nation’s most import­ant eco­nom­ic part­ner, how­ever plans for a trans-Caspi­an pipeline that would carry gas to Europe and a pipeline head­ing towards South Asia are demon­strat­ing a desire to expand exports bey­ond Iran, Rus­sia, and China. Des­pite these ambi­tions, and a pos­it­ive bal­ance of trade, Turk­menistan is still con­sidered a par­tic­u­larly isol­a­tion­ist state. How­ever, Turk­menistan remains one of the fast­est-grow­ing eco­nom­ies in the world, and has become one of the top ten glob­al pro­du­cers of cot­ton in an attempt to diver­si­fy. Cent­ral­ised state own­er­ship of the eco­nomy per­vades most large indus­tries includ­ing fin­ance and nat­ur­al resources, how­ever since Turkmenistan’s inde­pend­ence there has been a move­ment towards privat­isa­tion in trade, cater­ing, and con­sumer ser­vices, and private sec­tor own­er­ship forms the major­ity in agri­cul­ture, trade, and trans­port.